Authorities say they have responded to a shooting at a business in south-central Kansas that makes lawn mower products. HESSTON, Kan. (AP) - A man who wounded three people before storming into the central Kansas factory where he worked and shooting 15 others, killing three of them, had just been served a protection from abuse order that likely triggered the attack, a sheriff said Friday. 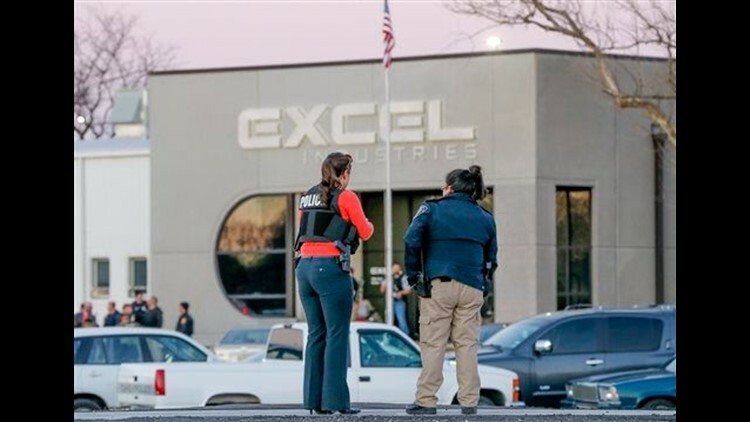 The attack Thursday evening at the Excel Industries lawnmower parts plant in Hesston ended when a police officer killed the attacker during an exchange gunfire, Harvey County Sheriff T. Walton said. He described the officer Friday as a "tremendous hero" because there were still 200 or 300 other people in the factory and that the "shooter wasn't done by any means." "Had that Hesston officer not done what he did, this would be a whole lot more tragic," Walton said. He declined to identify the suspect or the officer but said the suspect's name would be released later Friday. The names of those killed also weren't disclosed. The shooting came less than a week after authorities say a man opened fire at several locations in the Kalamazoo, Michigan, area, leaving six people dead and two severely wounded. Authorities haven't disclosed a possible motive in those attacks. Eleven of the people wounded in Thursday's attack were taken to two Wichita hospitals, where one was in critical condition, five were in serious condition, and five were in fair condition Friday morning, hospital officials said. The others were taken to a Newton hospital, and their conditions weren't immediately available. Walton said his office served the suspect with the protection from abuse order at around 3:30 p.m., which was about 90 minutes before the first shooting happened. He said such orders are usually filed because there's some type of violence in a relationship, but he didn't disclose the nature of the relationship in question. While driving to the factory, the gunman shot a man on the street in the nearby town of Newton, striking him in the shoulder. A short time later, he shot someone else in the leg at an intersection. A Hesston officer responding to the scene exchanged fire with the shooter and killed him. The officer was not injured. Walton said the attacker had an "assault-style" rifle and a pistol. Erin McDaniel, a spokeswoman for the nearby city of Newton, said the suspect was known to local authorities. She wouldn't elaborate. Associated Press writers P. Solomon Banda in Hesston, John Hanna in Topeka and Heather Hollingsworth in Kansas City, Mo., contributed to this report. Fisher reported from Kansas City, Missouri.